Okay, I know these all sound like party tricks, but the LG G8 has a lot more going for it. On its inside ticks the Snapdragon 855, which is currently the most powerful chip you can get in an Android phone. It also packs a dual-camera setup and one of the largest batteries we've seen in a high-end LG phone. Priced at around $600 after discounts, the LG G8 could be the perfect pick if you're hunting for a bargain. To find out if that's really the case, I spent a week with it in my pocket. As I mentioned above, the LG G8 doesn't look all that special at a glance. 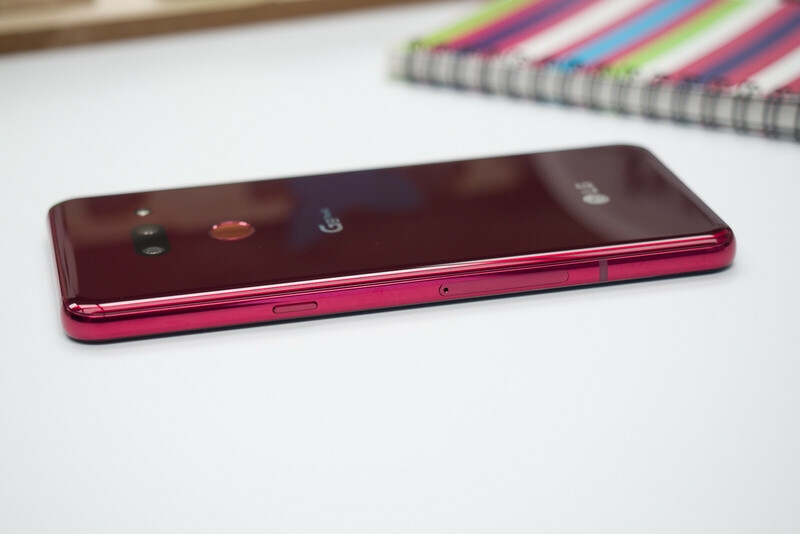 There's no denying that its glossy red color is striking, but overall, because of its familiar design, this can easily be mistaken for a phone from last year. LG's flagship is also available in black or grey, for those who'd rather blend in with the crowd. When I picked it up, however, I instantly noticed that the LG G8 is easier to handle than most other phones I've tested recently. It is still extremely slippery, just like every other phone made of glass and metal, but its thick, flat sides allow for a nice, comfortable grip. Curiously, the LG G8 is one of the very few handsets lacking a camera bump. On one hand, this results in a cleaner look with fewer distractions, but on the other, the entire back comes in full contact with any flat surface you lay the phone on. This could be the reason why there's already a tiny scratch over the camera lens on my review unit, even though its back is protected by the latest Gorilla Glass 6. LG introduced us to the dedicated Google Assistant button with the G7. The G8 has one as well, placed on its left side, and it behaves in a similar fashion: pressing it once brings up the Assistant; pressing and holding lets you interact with Google's AI in "Walkie Talkie" mode. The button can be disabled fully or partially but can't be remapped to do something else, such as to open a predefined app. Accidental presses do happen, but they were rare in my experience. Like previous LG flagships, the G8 is protected against the elements and carries an IP68 rating. I can also confirm that it can survive at least one drop from a bedside table onto hardwood flooring. And it has a headphone jack – a feature many users still demand. 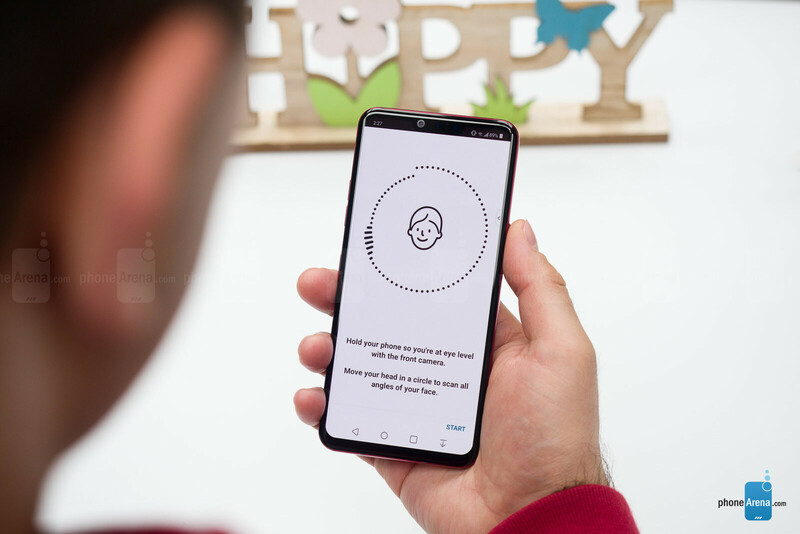 Yup, there are three different methods of unlocking the LG G8 using biometric authentication. On its back is a classic fingerprint scanner which is fast, reliable, and familiar. There's also Face Unlock, which uses the LG G8's Time of Flight Z Camera module on the front. Long story short, the face scan creates a detailed 3D map of your face, making it impossible to fool with a picture of video of the phone's owner and very difficult to circumvent overall. And Hand ID uses the same array of sensors to recognize you by literally scanning the unique pattern created by the veins in the palm of your hand. LG's Face Unlock implementation works well. While all three methods can be active at the same time, I forced myself to only use facial recognition for two days. I had a very low number of failed ID attempts – mostly instances when I wasn't looking straight at the phone. Face Unlock also works reliably in the sun and in complete darkness. Not shaving for a week didn't affect its performance either. If you wear prescription glasses, I'd recommend you to go to Settings and choose "Improve Face Unlock" to scan your face a second time with/without them. Wearing a scarf, however, resulted in failed face scans about 2 out of 3 times. I also tested Face Unlock with six different pairs of sunglasses. It failed to work with four of them and struggled with the other two. But again, using the aforementioned "Improve Face Unlock" option took care of things. The LG G8 supports Raise to Wake, and I've had it enabled throughout all of my testing. It doesn't work every single time, but it's not terribly unreliable either. There's also a Swipe to Unlock option which you can activate for Face Unlock. I have my G8 set to unlock instantly if I use the fingerprint scanner, but I use Face Unlock instead if I want to go through my lock screen notifications first, then I swipe to go to my home screen. 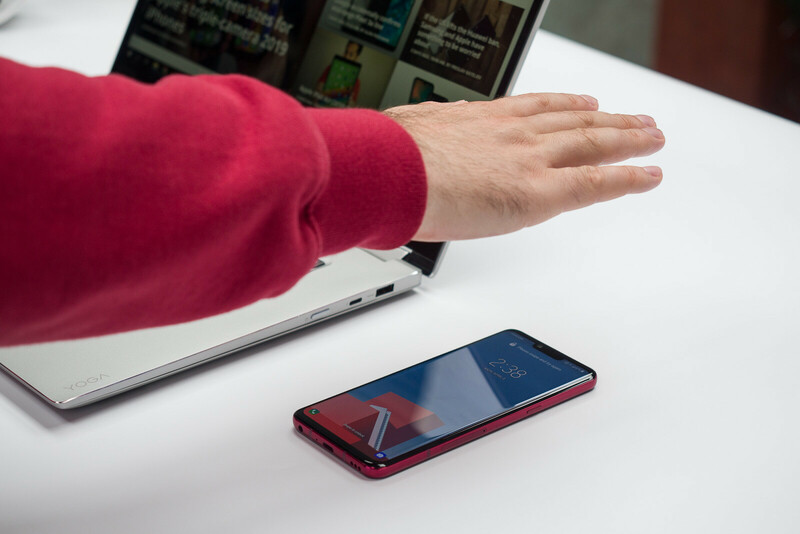 And finally, there's Hand ID, which is supposed to let you unlock your G8 without touching it – when it is laying flat on a table, for example. The best thing about this particular authentication method is that it is highly secure and extremely difficult to bypass. Unfortunately, it is too unreliable in its current state to be practical. The reading would fail if your palm is too close or too far from the screen (6 inches is the sweet spot) or not exactly over the Z Camera sensors. I tested it after washing my hands without drying them and it didn't work at all. The LG G8 comes with a 6.1-inch OLED screen protected by Gorilla Glass 5. Its native resolution is 1440 by 3120 pixels, but it is set at 1080p by default, presumably to improve performance and battery life, and it looks perfectly fine this way. Colors are noticeably cold by default, but if you go in the Display Settings menu, you'll find an option called True View. Do yourself a favor and enable it. This adjusts the white balance of the display (how warm/reddish or cold/blueish things look) so that it matches that of ambient light – and the screen looks much better as a result. As you've probably noticed by now, there's a notch at the top of the display – a necessary evil leaving room for the selfie shooter and all the Z Camera sensors. Thankfully, it doesn't get in the way of any content with the exception of YouTube videos filling the entire screen. You can "hide" the notch if you want to by applying a black background to the area on its sides. While the LG G7 had a "SuperBright" display capable of reaching 1000 nits of brightness, the G8 only reached 561 nits in our testing. Thankfully, we've never had any issues with outdoor visibility, even on a sunny day in the park. Speaking of brightness, however, I must point out that when the brightness control is set to Auto, you can't fine tune it to your liking. The brightness slider is simply disabled unless you uncheck the "Auto" toggle. I found this mildly annoying because I prefer boosting the brightness a bit when watching video. 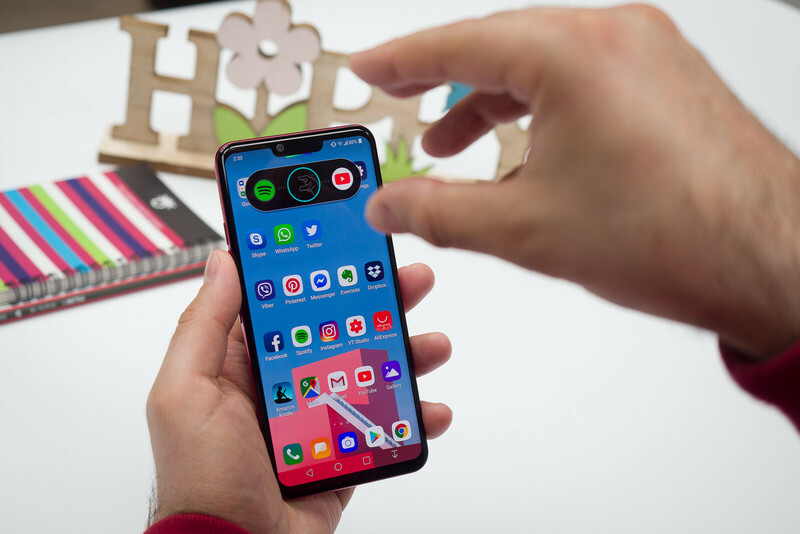 The LG G8 ThinQ comes with Android 9 Pie out of the box – the latest Android version available. Unfortunately, many of the functional goodies found in Pie, including Digital Wellbeing, haven't been implemented in LG's custom software. The only major Android 9 feature I found was Google's gesture-based navigation, which is disabled by default. I gave it a chance but quickly found out that it isn't the best gesture-based solution on Android. You don't gain any screen space and using Google's gestures instead of classic buttons doesn't feel any faster. There are certainly things to like about LG's custom Android interface. For example, it lets you disable the app drawer and have all app icons placed on the home screens instead, iOS style. And the fingerprint reader at the back can be used to bring down the notifications panel with a swipe. Familiar features like Comfort View (a blue light display filter), Always On Display (the time and notification badges are shown on the screen during standby) and the Floating Bar (an always-accessible panel with shortcuts) are also present. And advanced Gaming Controls let you disable alerts or manage graphics quality while playing games. On the downside, LG's custom interface lacks a Dark Mode – a handy feature we've been seeing more and more often. It could use some visual polish as well – the default theme welcomes you with a choppy and annoyingly long unlock animation (which you can change or remove, thankfully). 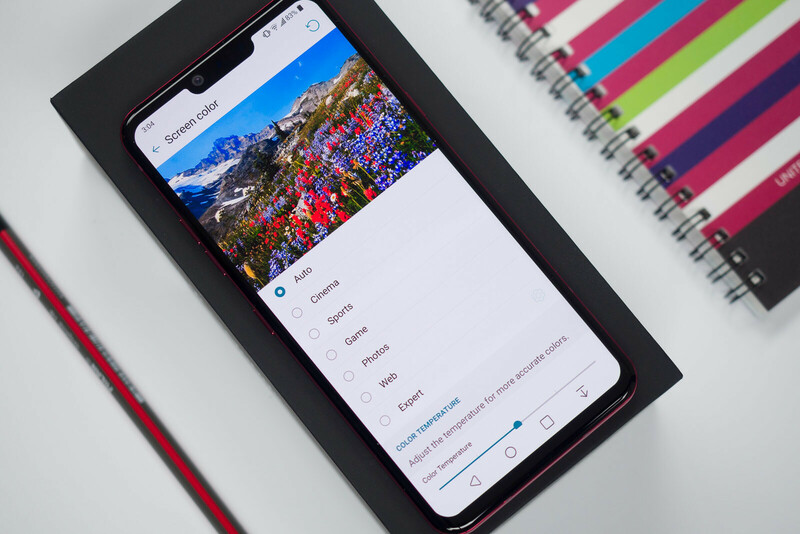 Air Motion is a unique LG G8 feature that lets you perform certain actions without touching the phone at all. Commands are given using hand gestures picked up by the Z Camera. You can set shortcuts to two apps, you can control audio volume or play/pause media in apps like Spotify, Netflix, YouTube, or the stock music player, you can take a screenshot, and you can dismiss alarms or pick up/reject calls. Unfortunately, executing Air Motion commands is quite the ritual, which makes the whole experience an exercise in patience. First, you hold your palm for a couple of seconds over the notch. When the phone detects its presence, you take your hand back a few inches and do a claw gesture. A pop-up window appears then, and you execute one of two actions by moving your hand left or right. The pop-up window will display app shortcuts if you're on your homescreen or media controls if you're in a music or video app. Bringing your fingers together takes a screenshot. Holding your hand in the middle for a few moments will display a virtual volume control knob that you control by "rotating" it left or right, which is probably the coolest part about the entire interaction scheme. On top of being slow and frustrating to use, Air Motion gestures feel largely redundant and unnecessary at this point in time. Sure, you can launch an app with a wave of your hand, but in most cases, after that, you'll still have to touch your phone to interact with the app in question. Perhaps these gestures might be useful in a few very specific situations some day, but right now, they're simply impractical and take too long to get the hang of. Powered by a Snapdragon 855, the LG G8 is among the fastest Android phones right now, and performance benchmark results reflect that (all performed at the default, 1080p display resolution). As expected, heavy games run without issues. The only time I noticed choppiness was during the start of a game of PUBG at high graphics settings. The user interface, however, does feel laggy from time to time. 6GB of RAM are certainly enough for most users' needs, but when launching apps or bringing up the recent apps list, for example, I've been noticing delays more often than what I'm used to. Last night, the Camera app literally took about four seconds to open. Overall, the LG G8 is fast enough most of the time, but it doesn't run as smoothly as some of the fastest phones around, such as the Google Pixel 3 and the OnePlus 6T. 128GB of built-in storage is the only LG G8 configuration available right now. You do get a slot for microSD cards if you need extra space, but even the 128GB on board (about ~100 GB are actually available) should meet the needs of most users. You'll run out of space rather quickly only if you shoot tons of 4K video. The LG G8 version launching in the US has a dual camera at the back. One is a regular 12MP camera with fixed F1.5 aperture and OIS, while the secondary one is a 16MP shooter with a super wide-angle lens. It's a setup similar to what we had last year on the LG G7. In certain parts of the world, including South Korea, the G8 will have a third camera with a 2x telephoto lens. 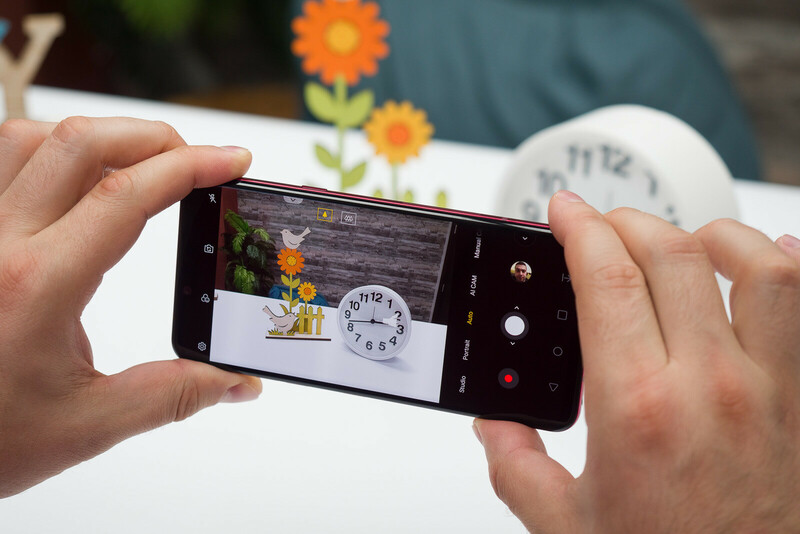 Upon launching the camera app, we're presented with a familiar set of features seen in previous LG high-end phones, such as Portrait Mode and full manual camera controls for photos and video. AI CAM, first seen on the LG G7, is also present – and seemingly less aggressive than before. A long press in the viewfinder activates a Google Lens visual search. What's new is the dedicated Studio Mode, which reminds us of Apple's Portrait Lighting effects. We also see a Night View mode for taking photos in low light. It must be pointed out that the app feels a bit sluggish at times: it can take a few moments to launch or switch from one mode to another. It's not bad in terms of responsiveness, but we're used to camera apps being generally faster. You can zoom in or out by sliding the shutter button, which sounds neat, but when tapping, it is easy to accidentally zoom in or out instead of actually taking the picture. The good news is that the LG G8 is well capable of taking pretty photos. I had the chance to test its cameras extensively during a short trip out of town, and the results were very pleasing overall. There are no AI modes or image enhancers enabled unless you activate them manually, so Images retain their natural look, with mostly true-to-life colors. But details could be better. Zooming in reveals signs of aggressive sharpening and heavier noise filtering in low-light situations. The LG G8's wide-angle camera is ideal for capturing epic landscapes or when shooting in tight spots, and I used it extensively during my vacation. It is a valuable asset that gives you a whole different perspective to experiment and have fun with. It does have its drawbacks, however. One is that the lens does introduce a bit of distortion in the image, especially around the edges. It is also less sensitive to light, so shots taken in dark environments may be fuzzier compared to those out of the main cam. And since there's no autofocus, the wide-angle lens isn't suitable for close-ups. The light flares you might notice in our wide-angle shots are not typical. They're caused by our camera lens having a tiny scratch on it, not by a camera defect. Like most other phones these days, the LG G8 offers a Portrait Mode, in case you want to separate your subject from the background. The edge around your subject is well defined, although the software might struggle a bit with loose strands of hair, and the amount of blur can be adjusted after the fact. In addition to that, you also get a Studio Mode, which acts a lot like Apple's Studio Lighting effects. You may simulate the look of studio lights on the face of your subject, adding highlights or shadows to accentuate certain features. It is fun to play with. Night View is a new mode meant to improve your low-light photos. In theory, the algorithm works by snapping multiple photos in rapid succession and then stacking them together for a sharper, cleaner image. Capturing and processing a shot takes several seconds and requires you to hold the camera still for a bit longer than usual. In practice, I haven't noticed any difference in quality between photos shot in Auto and ones taken with Night View. There's a brightness slider while using the mode, but its effect on exposure is minimal. The LG G8 has an 8MP front-facing camera with autofocus. Selfies look good when shot during daytime, but detail starts to suffer when shooting in low light, as it would with any other camera. It is common for low-light selfies to come out a tad blurry. General image quality is comparable to what you'd get out of the Galaxy S10. Thanks to the Z Camera, the G8 is also capable of applying Portrait and Studio modes to your selfies. The Spotlight studio effect appears to be particularly useful as it may light up your face from a certain angle in case ambient light isn't optimal. But when it comes to edge detection, the camera's performance could be better. 4K video at 60fps – that's the maximum quality setting allowed by the G8's main and wide-angle cameras. However, I would recommend using 4K at 30fps instead for a couple of reasons. Firstly, image stabilization works really well only at this quality setting. Secondly, only at 4K30 you can switch between the main and wide-angle cameras while shooting. 4K60 doesn't let you switch between cams once the video is already rolling. While video quality is good in general, the audio could sound better. There appears to be a wind noise filter which activates automatically. Although it does limit noises, it makes voices sound harsh. 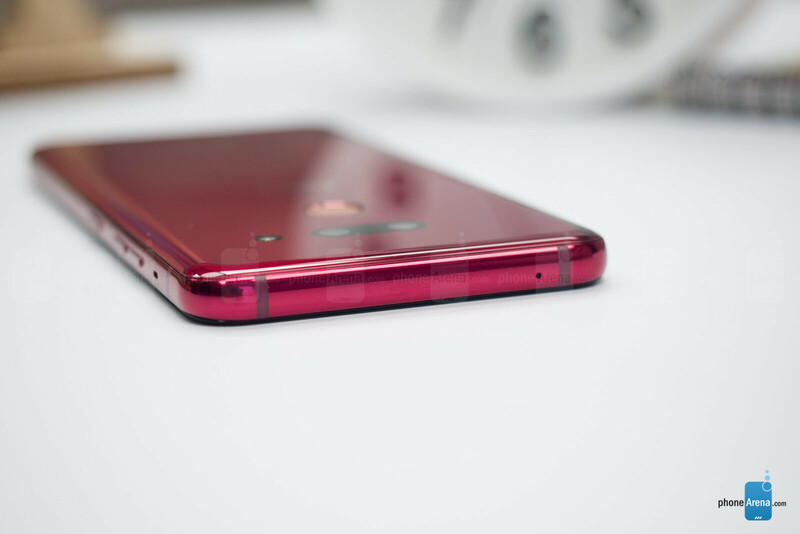 If you take a closer look at the LG G8's notch, you'll notice that there's one thing missing – an earpiece. That's because the screen itself acts as a speaker and vibrates to produce sound. Sound quality during calls is really good, with voices coming through loud and clear. Like the G7 before it, the G8 has a Boombox speaker, meaning that its entire inner volume acts as a resonance chamber to enhance the output of the bottom-firing loudspeaker. Moreover, placing the phone on a flat surface further amplifies the sound, making it even louder. But while the loudspeaker is definitely loud, it isn't the clearest around. It sounds boomy overall and could use more treble. Together, the Boombox speaker at the bottom and the vibrating display form a stereo pair, but the sound is noticeably uneven as the screen is much quieter. Next to the G8, the Galaxy S10 sounds clearer and more balanced. As we mentioned earlier, the LG G8 has a headphone jack. However, our T-Mobile review unit didn't come with a pair of earphones in the box. 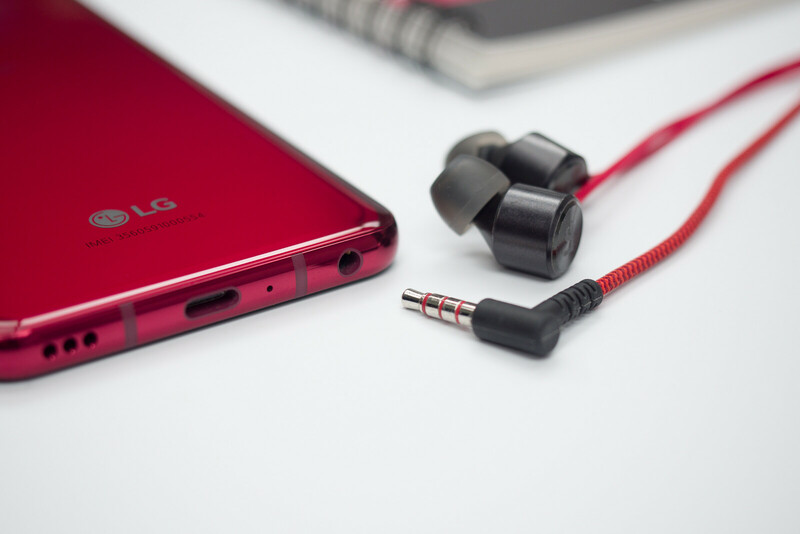 Since the G8 comes with LG's Quad DAC, it should have no problems driving audiophile-grade, high-impedance earphones. 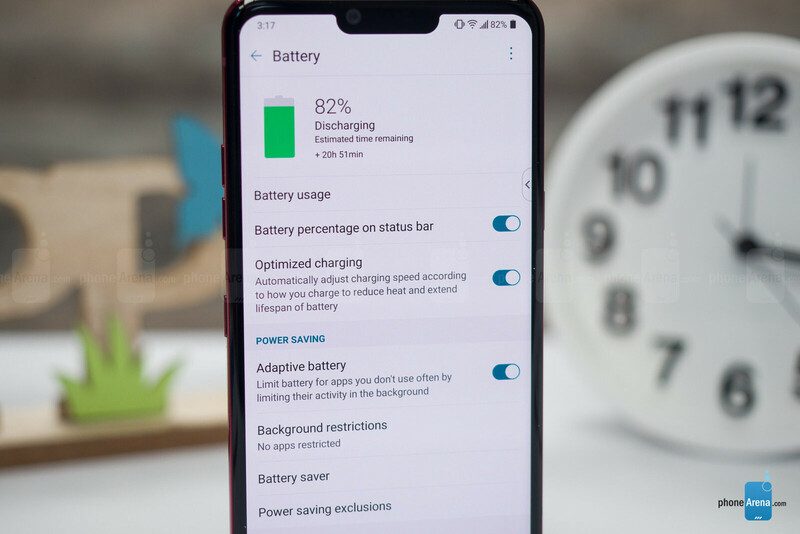 The LG G8 delivered a respectable score of 7 hours and 30 minutes when subjected to our custom battery benchmark. It's not a record breaker by any means, but realistically speaking, the phone can last a couple of days between charges if used with moderation. In my experience, I've been getting a day and a half of average use out of it, with a couple of hours of Spotify streaming throughout the day, some light gaming during my 30-minute lunch break, and a healthy dose of YouTube videos in the evening. Disabling the Always On Display feature will extend your mileage even further. All in all, battery life with the G8 is solid and not something to be worried about unless you spend your day glued to your phone. Wireless charging is supported by the LG G8. If you choose to charge the phone with the old-fashioned charger in the box, this will take about 1 hour and 40 minutes, which isn't a remarkable figure, but it's not too slow either. At $850, its suggested retail price, the LG G8 would have been tough to recommend. 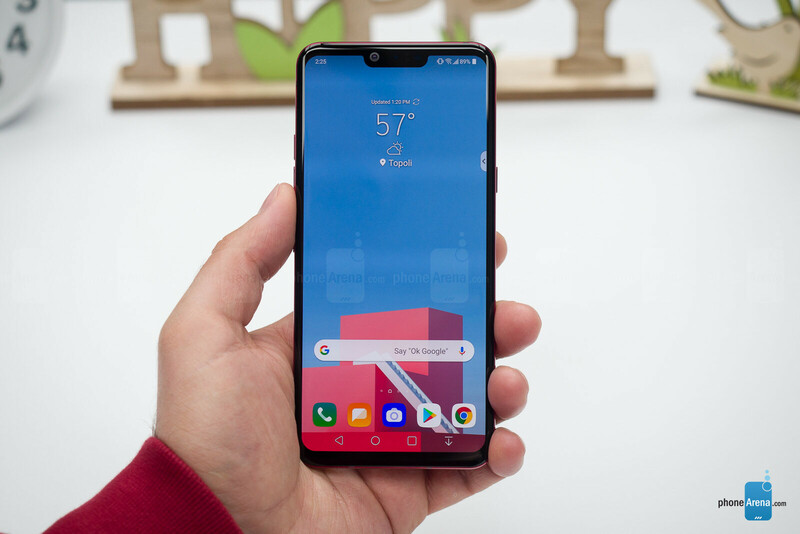 That's about as much as a Galaxy S10 costs right now, and Samsung's flagship is superior in a number of ways: it has a more versatile set of cameras, it runs a more polished custom software, and its stereo speakers sound noticeably clearer. 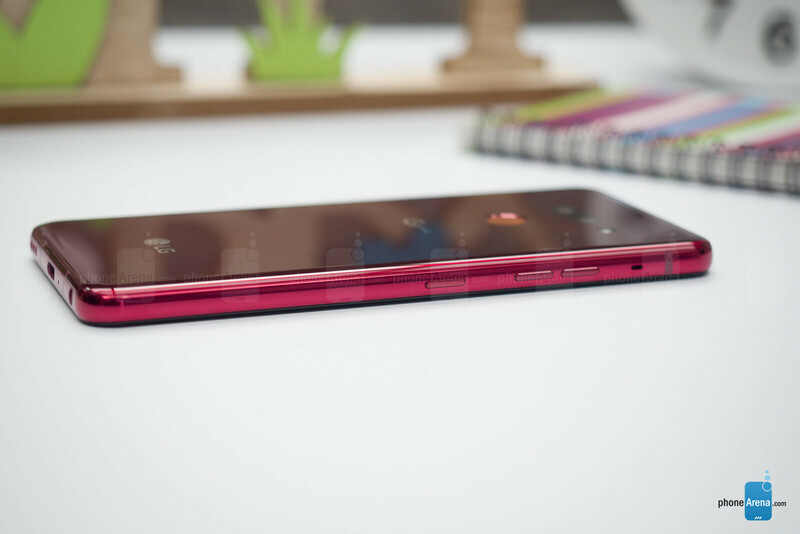 The G8, however, can be currently had for just a little over $600, which is significantly less – and a fair price considering what you get in exchange: a well-rounded Android phone with a good-looking screen, the fast Snapdragon 855 chip, and a capable set of cameras. We're also glad to see that LG stuck with a classic fingerprint reader and paired it with reliable facial recognition. In-screen fingerprint readers may look cool and futuristic, but they're simply not good enough yet to prefer over a classic solution. What I find perplexing is that LG chose to launch the G8 with Hand ID and Air Motion gestures instead of scrapping these ideas while they were still on the drawing board. Both these features feel half baked and largely unnecessary, not to mention that featuring such gimmicks so heavily in promotional materials could have an alienating effect on potential buyers. Long story short, the LG G8 is a decent Android phone at a reasonable price. Do check it out and don't pay attention to the distractions. Can't wait to get this phone. Another forgettable LG phone that will get a bunch of discounts and bargain bin price cuts. Great thing for consumers. Actually played with it at Tmobile the other day. Once its had a few price cuts it'll be the best lower cost phone out. Do you have an issue with discounts? I never said nor implied that I did. I don't know what "the" feature is, but LG needs to figure out a feature that is really the iPod of phones. My Galaxy S4 had the air gestures and I used it for a week before it was just a gimmick. I like the idea of hand gestures, etc... But yeah just nothing excites me enough about LG year after year. The idea is great, but not the execution. Hovering your hand over the content that you wish to see didn't really pan out well for the Samsung phones and the Sony phones that used to do this earlier than the G8. Not at that price point.. If the division is losing money, it's probably not worth closing up shop. LG could kill the mid-range game and take a lot of Motorola's business if they wanted to, but they're a premium OEM in other areas like TVs. I think LG is hoping to stay relevant in mobile until tech from their other divisions is able to be incorporated into mobile devices. If they were to leave, they would almost completely give up the game and would be near impossible to get back in. Sony uses stuff from Bravia, Alpha and Cybershot for years. LG does not because they do not want too. Not because they were not able. G8 is the first of their cellphones with stereo speakers. Even their midrange tablets had. Thanks for the information. I am confused at what you are responding to though. Any clarification? They do it because one day, when people upgrade all their fridges and other house hold appliances that are "thin-q" compatible, they would very much have their own phone as a remote for controlling all their household appliances. Sure, they are losing quite a bit of money, but LG is a really big company. Which OEM isn't lacking originality these days? They're all essentially the same with tiny tweaks to the sharpness of corners and camera placement. I for one really like the whole one slab of glass design. The lack of a camera bump is really appealing. Don't know how that would hold up after the back is cracked though. 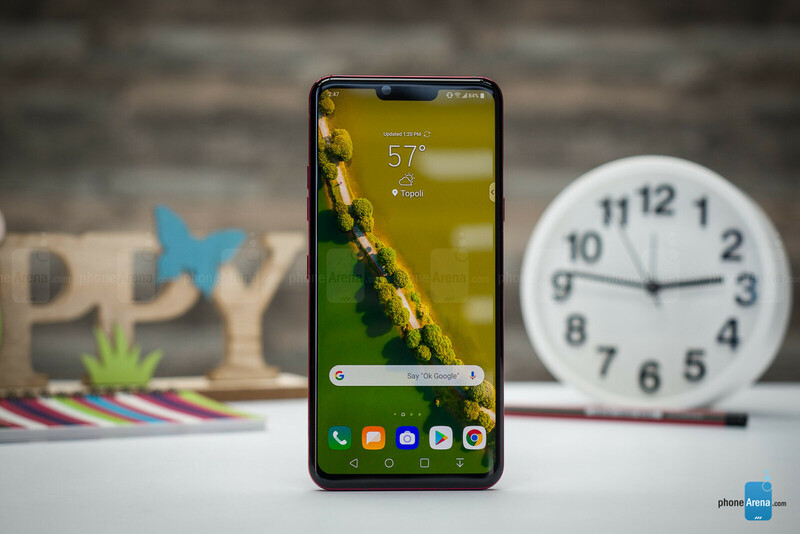 If they were gonna use oled, it would have been really cool to go with the S10 5G way of adding a ToF sensor, not a notch. But still, I guess that is the way things are. Personally like the secured face unlock, not a big fan of all the motion gestures. They could have gotten rid of it and just slashed the price around like 25 or 50 bucks.